ERCOFTAC will host Hybrid RANS-LES Methods for Industrial CFD, (VIII) Overview, Guidance and Examples on 20-21 November 2018 at NUMECA International in Brussels, Belgium. 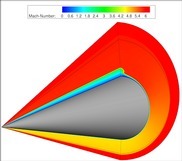 Turbulence is one of the last remaining challenges in the simulation of fluid flows. Although RANS (Reynolds-Averaged Navier Stokes) turbulence models are still very widely used, these approaches are being slowly supplanted by Large Eddy Simulation (LES). However, LES is prohibitively expensive for the industrial simulation of wall-bounded flows, especially at high Reynolds number.